In Central and South America, where the Coca-Cola single serve glass bottle is very much in use and very popular, it is custom that when you buy a Coca-Cola (or any other brand or flavour for that matter, as long it is bottled in a single-serve glass bottle) at a street stall or a kiosk or from a vendor at the beaches and you haven't an empty bottle to trade-in, the soft drink is poured into a plastic bag with a drinking straw, leaving the empty glass bottle with the vendor. However for world famous brands with iconic packages, like Coca-Cola, this market format is quite a problem because of the lack of brand values communication. Consequently some clever chap at Coca-Cola in El Salvador found a answer to this problem: to adapt the product to this market reality, he initiated a campaign offering plastic bags in the form of the iconic glass bottle with its logo. 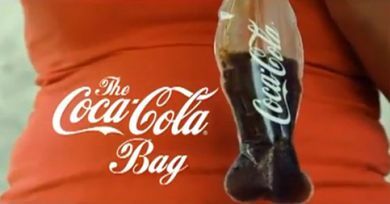 The Coca-Cola Bag is made of bio-plastic.